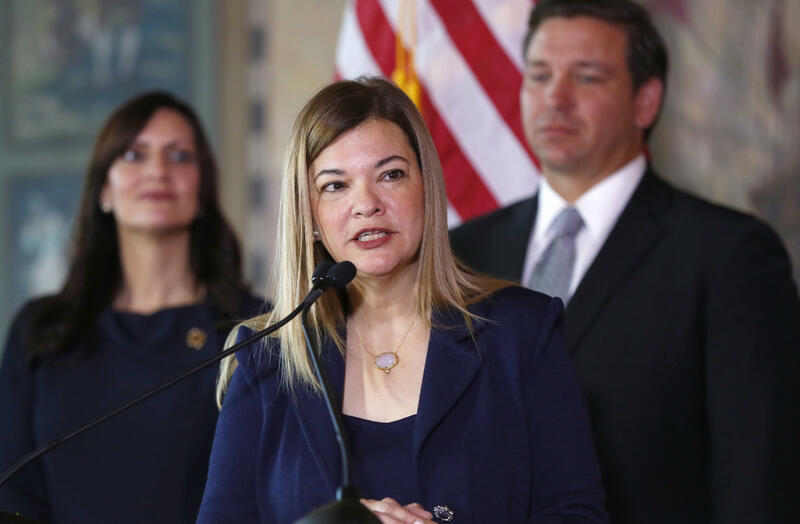 Barbara Lagoa, center, Governor Ron DeSantis' pick for the Florida Supreme Court, speaks after being introduced, as DeSantis and Lt. Gov Jeanette Nunez, left, look on, Wednesday, Jan. 9, 2019, in Miami. Governor Ron DeSantis has picked District Appeals Court Judge Barbara Lagoa as Florida’s newest Supreme Court justice. A Governor Jeb Bush appointee to South Florida’s 3rd District Court of Appeal, Lagoa is a native Floridian with a background as a federal prosecutor and private practice attorney. She is the first Cuban-American woman to serve on the state’s highest court. And, Lagoa accepted her new job at Freedom Tower in Miami – where her parents were processed as exiles from Cuba decades ago. “Over 50 years ago, my parents, like so many others, came to this country from Cuba to start rebuilding their lives in the land that offered them opportunity – but more importantly, freedom,” Lagoa said Wednesday. DeSantis says the graduate of both Florida International University and Columbia Law School stood out among the 11 candidates for vacant seats. “She clearly had the most judicial experience – I think she’s had over 11,000 cases and 470 opinions. And in those 12 years, and in all those opinions and all those cases, she’s earned the respect of the Florida legal community,” DeSantis said. DeSantis made his choices for the State Supreme Court a point of emphasis during his inauguration festivities this week. Based on Lagoa’s remarks as she accepted the post, she fits the newly-minted Governor’s criteria. “I am particularly mindful of the fact that under our constitutional system, it is for the Legislature, not the courts, to make the law,” Lagoa said. Lagoa is the first of three State Supreme Court appointments DeSantis will make.